Dear Reader, there is nothing that brings me such unbridled joy as what I consider to be a richly-written, atmospheric historical fiction novel. I have never been one to wish for times past, because I am a modern lady who enjoys modern amenities such as public works systems, vaccinations, and air conditioning units. However, I certainly do take delight in visiting other times and places, whether they be drab or fab. Historical fiction is an all-encompassing genre that features a variety of cultures and time periods and locations - to narrow the scope, I’ve come up with three titles that are linked by their country, some general themes, and ones that are best when paired with a cup of tea. The Gentleman's Guide to Vice and Virtue by Mackenzi Lee. The minute (nay, the second) this book was announced, I knew I would absolutely adore it. A bisexual British lord in the 1700’s who is about to embark on a grand tour of Europe with his best friend / unrequited love and his bitingly clever little sister in tow? The blurb promises adventures, debauchery, and romance; it delivers. The main character, Monty, is a likeable enough young rogue whose poor decision making skills and blatant ignorance sometimes put him in cringeworthy situations. 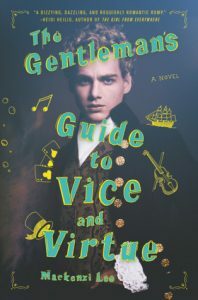 The Gentleman's Guide to Vice and Virtue is a deliciously fun novel I gobbled up in only a few sittings, but it still packs one heck of a punch. The day I finished listening to the audiobook (fabulously narrated by Tom Riddle himself, Christian Coulson), I immediately went out and purchased my own copy so that I can re-read it at my own leisure. If all of that isn’t enough to convince you that this book is incredible, there are also pirates. The Fair Fight by Anna Freeman. This book was all the rage several years ago on Booktube, so mostly I was afraid to pick it up for fear it would be a similar situation as to Burial Rites by Hannah Kent (a book that is often lauded but, for the record, one in which I firmly detest). Female pugilists in late 1700's England - a story about overcoming your situation, gaining independence, and the lasting power of female friendship? Surely the book itself is good in theory, but executed poorly, right? It really couldn’t be as phenomenal as it sounds, right?! WRONG. The story is gripping and surprisingly fast-paced considering the setting, and the characters are so compelling I became emotionally attached in an instant. 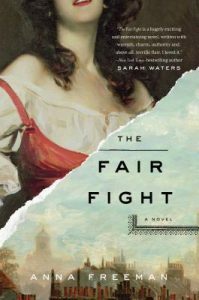 The Fair Fight mainly follows two strikingly different female characters: Ruth, a scrappy, smart-mouthed individual who was born in the brothel her mother now runs, who isn’t quite pretty enough to be considered useful like her much more beautiful older sister; and Charlotte, who is born to immense wealth and privilege, but whose physical appearance is ravaged by smallpox, making her marriage and social prospects relatively non-existent. The two come from polar opposite backgrounds, but their worth as women transcends their aesthetic beauty and their ability to serve other people. Ruth's fierceness and her indefatigable resolve to forge her own destiny and Charlotte’s cleverness and her ability to never be quite as she seems makes them both remarkable additions to the genre, and ones worth rooting for. I literally cheered once I reached the ending. Terrible pun aside, this one is a real knockout. As Meat Loves Salt by Maria McCann. This is the book that ended the Great Reading Slump of ‘17. I have always considered myself to be a voracious reader, but last year, prior to this magnificent tome, I was relegated to anxiously picking through random books only to give up on them minutes later. It was frustrating, to say the least. Recommended to me by a wonderful friend whose reading taste is always impeccable, I knew As Meat Loves Salt would be a standout read, but I underestimated just how truly excellent it would be. Set during the English Revolution, this novel is, to put it bluntly, a total assault on the senses. Maria McCann’s narrative style is visceral and immersive, even grotesque in its realistic descriptions of everyday life in the 1600’s. In spite of (or perhaps because of that), her prose is gorgeous. She has created a main character, Jacob, who for all intents and purposes is a despicable, beastly young man whose only goal in life is to better his situation without ever considering the humanity of others. It should be easy to hate him, though the author presents him in such a way that you will find yourself sympathizing with him, even when he is vulgar or terrifying. This complicated relationship between reader and protagonist leads to moments of such bittersweet delight when Jacob is inexplicably kind, or intense sorrow when he is heart-broken over his impulsive actions. I found myself wishing for a better life for him, even though he might not deserve it. 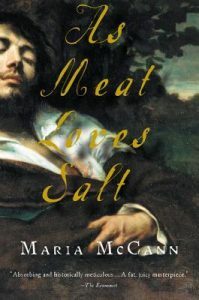 Maria McCann is a genius author - As Meat Loves Salt has been described as her literary masterpiece, and I am inclined to agree. There you have it, Dear Reader. Now get to it.